Jaggery rasgulla recipe/Gur rasgulla is an addictive winter delight. These spongy, melt-in-mouth cheese balls in an aromatic jaggery syrup… just taste heavenly. This recipe is mainly prepared with chenna or Indian cottage cheese and date palm jaggery. A slight variation of rasgulla/rasagulla/rasogolla recipe. Traditionally this sweet is made with date jaggery/date palm jaggery popularly known as Patali gur/nolen gur. The earthen flavor of the jaggery with the cheese balls makes the sweet more delicious. This jaggery is easily found in West Bengal. Especially during the winter season and is available in two forms solid and liquid or syrup. The syrup tastes so delicious… It makes my mouth water even while talking about it. With some simple tips and tricks, it can be easily prepared at home. Date jaggery is a must in this recipe. However, you can use any other jaggery if you don’t find this. But I would suggest do try once with date palm jaggery, you will definitely fall in love with this. 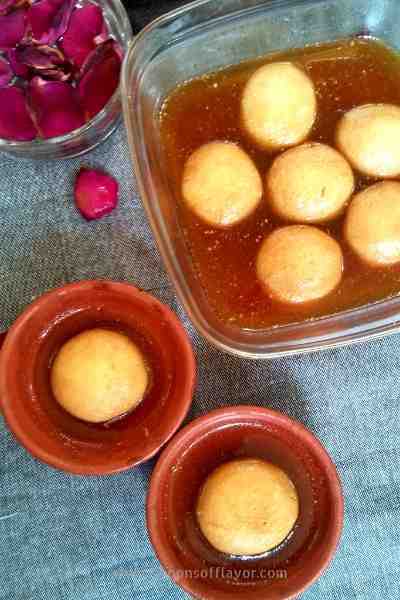 To make this jaggery rasgulla recipe, here I have used cornstarch while kneading the chhena. Maida can also be used in place of cornstarch. I have described the recipe with all tips and tricks. Follow each step to get the best result. 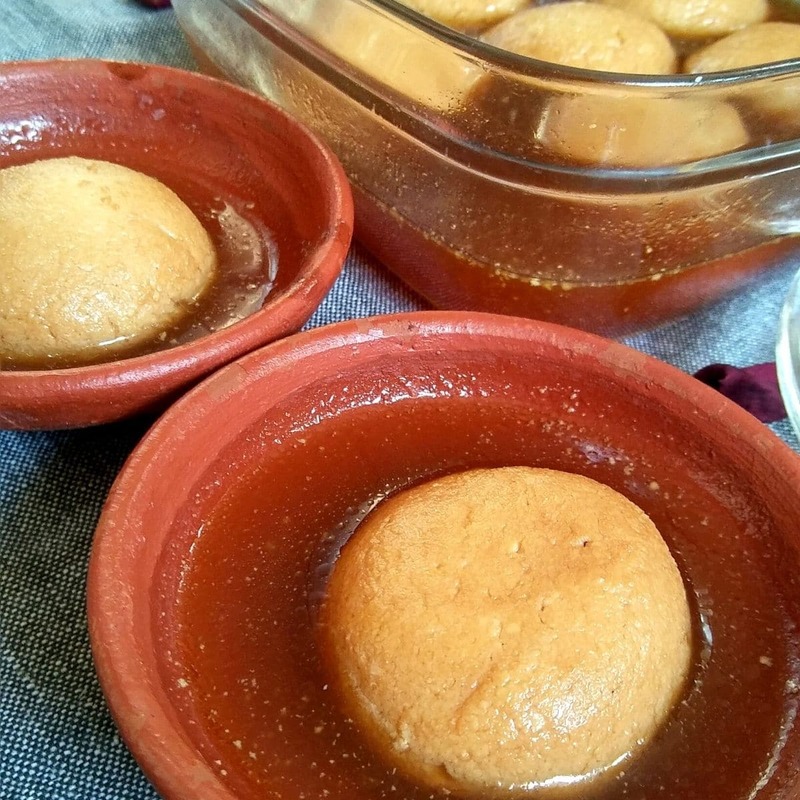 Let me know your thoughts about this jaggery rasgulla recipe in the comment section below. Also, you can connect with me on Instagram, Facebook, Pinterest, and Twitter. 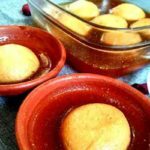 Jaggery rasgulla recipe/Gur rasgulla is an addictive winter delight. These spongy, melt-in-mouth cheese balls in an aromatic jaggery syrup… just taste heavenly. This recipe is mainly prepared with chenna or Indian cottage cheese and date palm jaggery. A slight variation of the rasgulla/rasagulla/rasogolla recipe. Heat the milk in a pan and bring it to boil. Once milk starts to boil, reduce the flame and add 1 tsp vinegar at a time and stir. Repeat the process until you see the milk curdles and whey separates. Strain it with cheesecloth or muslin cloth and rinse under running water to get rid of any sourness from the vinegar or lime juice. Now squeeze gently to drain out extra water and put it under a heavy object for 5-10 minutes. The chhena should not be too dry. Knead the chenna with cornstarch by mashing with your hand until you get a smooth dough or your hands become slightly greasy. It will take around 8-10 minutes to get a smooth dough. Divide the dough into equal portions and make small, round balls. Just make sure they are crack free or else they will break while cooking. In a wide bottomed pan or pot heat water followed by sugar, jaggery, and cardamom powder. Bring them together to boil until jaggery melts. The syrup must be of a runny consistency. No need of making one string or two string. Add the chenna balls slowly one by one to the bubbling syrup. Cover and let it cook for 8 minutes over high flame. Then Remove the lid and you can see the balls are increased in size. Now slowly turn each of them around once and again cook them over a high flame for 3 minutes. Once done reduce the flame to low to medium. Cover and cook for 15 minutes more. Check in between and slowly turn them around twice. Remove from flame and transfer to a bowl with the syrup. let them rest for 4-5 hours. Remember the rasgullas must be soaked in the syrup or they will be flattened. Now they are ready to serve. The chenna for making the rasgulla should not too dry or moist. If it is too dry rasagullas will turn hard. If too moist, they will not retain in shape or break while cooking. Do not over knead the chenna, or else the rasgullas will become hard. Use a big vessel or pan. There must be enough space for the balls to move and grow in size. Cooking time= 8 minutes on high flame with covered+2 minutes over high flame uncovered+15 minutes over low to medium flame with cover. The syrup should be of a runny consistency. If it becomes thick in between add some water. If you want to add more jaggery then take some premade syrup and heat up with jaggery together until the syrup is ready. let it completely cools down and then pour it over the rasgullas. Do not add extra water in that. It will spoil the rasgullas. This recipe will straight go to our fb group Healthy Wellthy Cuisine. And this time the theme is ‘WinterDelightsAtHW’. 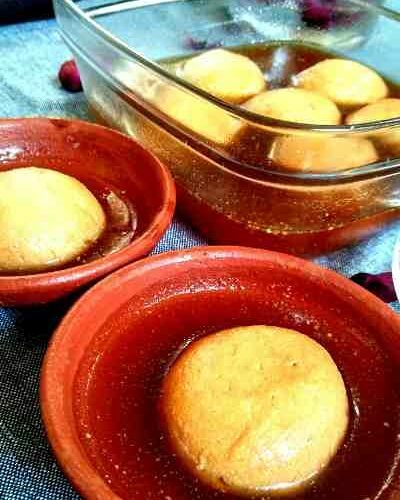 Rasgolla in jaggery syrup, would love to try this. This is new to me and would love to try. 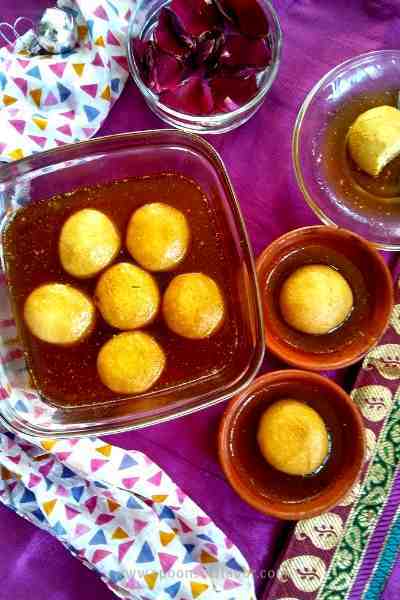 Rasgullas Lok lively with the beautiful colour jaggery and have come out beautiful and definitely jaggery rasgullas are a guilt free for the sweet tooth . You cannot keep me away from any chenna dish, be it rasgulla, rasmalai, chum chum or champakali! Soaking them in jaggery syrup makes it slightly less guilty! Fabulous share dear <3 Love it! 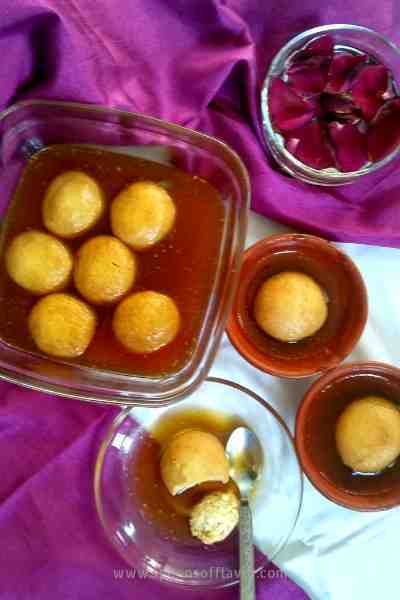 WoW Geetanjali , awesome these rasgullas look.. Simply amazing. What a beautiful colour..
I’ve had the opportunity to taste date palm sandesh in Mayapur, so am sure these rasgullas must be so delicious. Great way enjoy a famous dish with a healthier sweetener. Great recipe. Rasgullas and that too with healthy twist! Loving this share dear. So amazing.